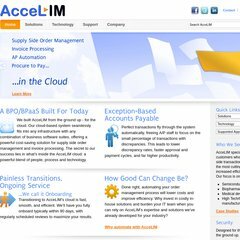 Topics: Solutions, Invoice Processing And E-invoicing, Technology, Accel-i-match™, and Virtual Po™. It is hosted by Yahoo Inc (California, Sunnyvale,) using YTS/1 web server. Accelim.com's server IP number is 98.139.135.21. It has 4 nameservers, including yns1.yahoo.com, yns2.yahoo.com, and ns8.san.yahoo.com. A ping speed test response, is timed at 34.1 ms.